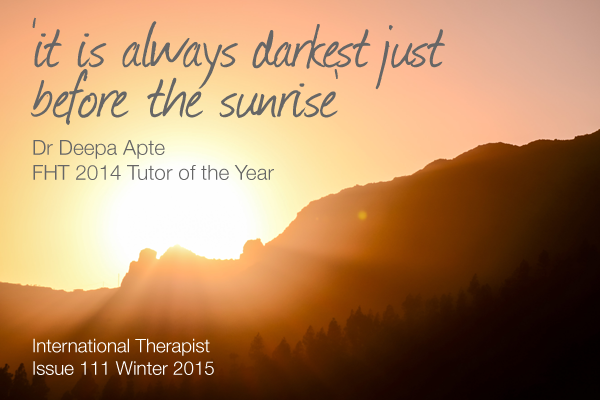 ‘It is always darkest just before the sunrise.’ – a favourite quote from Dr Deepa Apte, FHT 2014 Tutor of the Year. Deepa was featured in the latest issue of International Therapist (Issue 111 Winter 2015), where she talks about making ayurveda relevant to a Western lifestyle and the importance of body and mind for health. Log in to read the interview on page 66. Posted on 27 February, 2015 by Federation of Holistic Therapists (FHT). This entry was posted in quotes and tagged quotes. Bookmark the permalink.